Read the review of a GVCall - a prepaid service that allows you to make international calls at a fraction of the rate what your telecom operators offer. Know how it performed in our review and if this is something you too can use! A few days back you might have gone through news that Department of Telecommunication in their review of OTP providers have recommended that though messaging services should be allowed to run as they are now, but VoIP services, especially the international ones should be brought under the same regulatory framework that the traditional telecom operators have to follow. This would mean that whatever money you save on international calling to your family and friends by using services like Skype or Viber would now be a thing of past. This has the potential to disrupt your monthly bills to a large extent. But when there is a demand, there is a supply! VoIP is not the only way to do free or cheap calling across continents or even your neighboring country. There are other professional services that offer you quality calling services within the borders of a country or abroad at a fraction of the cost. 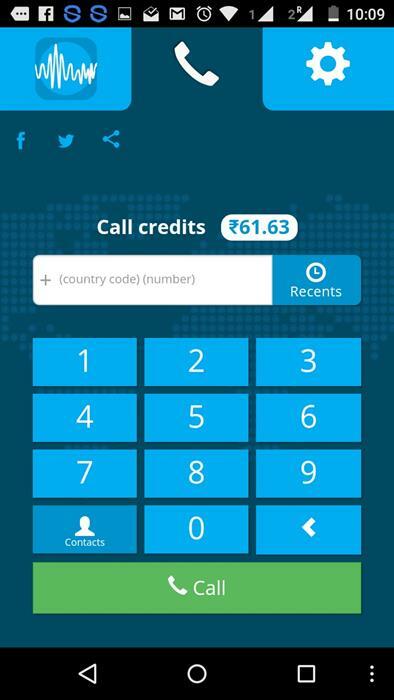 One of such services is offered by GVCall which doesn't use VoIP to make calls but rather uses GSM to connect you to a phone number within or outside the country. I tried the app to make calls to Canada and Bahrain and my experience was more than satisfactory. Let me take you through what all I found while using this app. I used an Android phone to try out the app but you can use it on iPhone too. 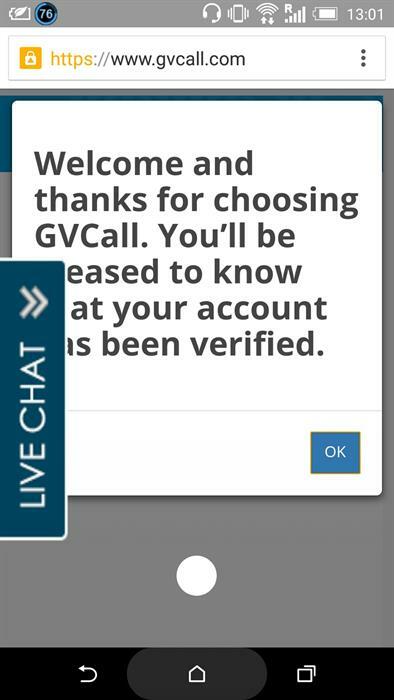 You need to start with downloading the GVCall app from Play Store. It is around 8 MB is size and will take only a few minutes in installation. Once you start the app you need to sign up for the service. It will take a few seconds to create the account, verify it and create a PIN which will be used to complete the registration. Once you have done this simply sign in to your account, click on the Menu (wheel up in the right corner), click on the Call from button and enter the number you will be calling from. Yes, you read it right! You just need to login to your account with your credentials but after that you can connect any two numbers using your account. It means if I have made the account with number "A", I can make a call between A to B or B to C or A to C from the smartphone "A" having the GVCall app. That's quite cool honestly. 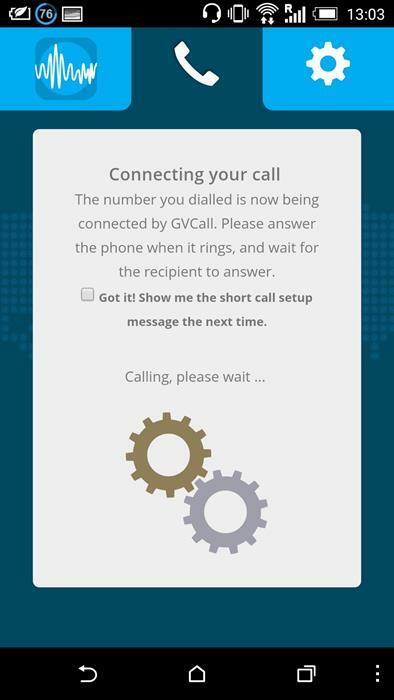 This means you just need to have 1 Android or iPhone to use GVCall. Let me share how I think this app is working. In the first step it is inquiring its servers to check how much balance the customer has. Once that is validated and you have sufficient balance, you are allowed to make a call. 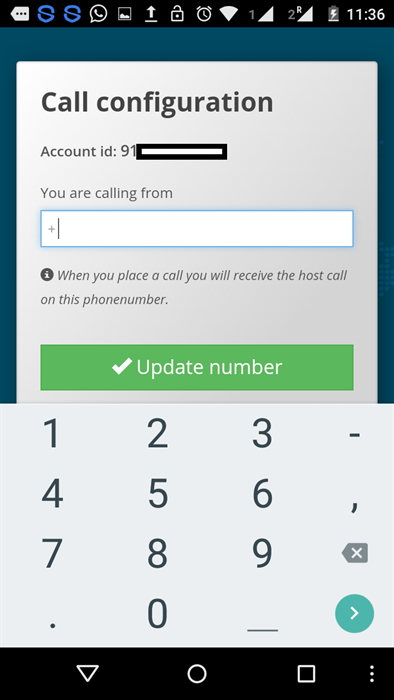 The host smartphone with GVCall app calls a local number which is of GVCall with details of the the two parties who have to be connected. Now GVCall system initiates the calls to both the numbers and acts as an intermediary. However, this raises a serious security implication. If I am A in the above example and I am connecting B and C, both B and C have no information that it is me who is connecting both of these numbers. B and C will see each other number's on the screen and due to this B will think that C is calling him and C will think that B is calling him. Though it might not look big, but this does have a potential to become a big security risk. All this while, the number "A" is actually paying cost of a local call. Which means your total cost of using the app is actually the cost being deducted by GVCall as well A's operator. The amount I paid for a call from India to Canada was Rs.9 approximately for a call lasting less than 1 minute. There is no doubt that call quality was much better than what you get with a VoIP service. It was like talking to your roommate sitting in another room. You won't have to worry about the call quality whether you are on a 2G or 3G network. All you need to ensure is that your GSM network is strong enough and you are in a reception area with good signal strength. It doesn't matter in which part of the world you actually are! You just need a basic data plan and GSM connection. 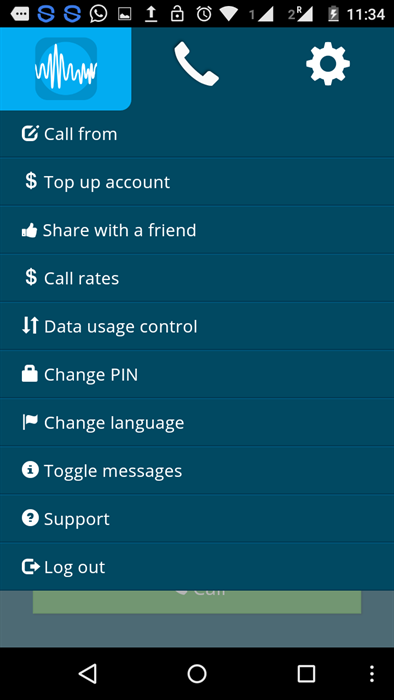 Also Read: How to make free phone calls using FreeKall cloud-based service? Change the SIM card to the local country and use the app to make cheaper international calls from whichever country one is travelling to. This means one DOES NOT need to buy the expensive options like Matrix cards. The calls are up to 70% cheaper than the Mobility tariffs. GV Call app is a great tool for enterprise customers who need to make calls on the go — without having to wait for or even strong 3G signals as GV call app works on 2G. GVCall is an amazing upgrade to VoIP for people looking for a better service to make international voice calls without inviting those big bills. It needs no Wifi, is available worldwide, has fewer call drops and charges lower than your traditional phone company. 4. Call charges are shown before you actually make a call so that you avoid any unpleasant surprises. 5. You can recharge the account of your friend or family members too making it easier to stay connected.